I’m pretty happy to see more restaurants lately that are offering food from local farmers. It’s a cool thing for the palate, sure. But making the commitment to attempt to serve up as much local and organic as possible is a step further than most places are willing to take. That’s why I’m thrilled about Eureka Springs’ new eatery, The Garden Bistro, and the ideas chef Lana Campbell is creating. The little shop on North Main is bright with color, full of art, and completely without a standard table menu. Yeah, that sounds strange, but it’s true -- the menu changes daily depending on what’s being offered. It’s a cool concept. 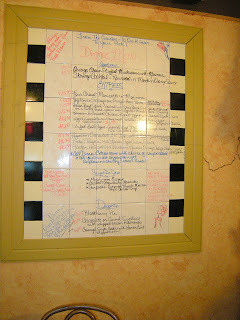 The menu for the day is written on a wall of tiles near the kitchen, and then conveyed to the chef via a very attentive waitress. 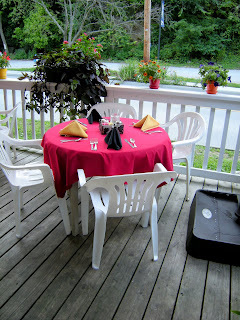 My traveling companion and I dined there on a cool July evening. 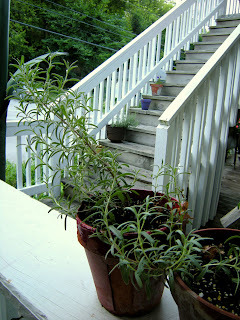 We were enchanted by the Tuscan-like décor and all the fresh herbs growing on the deck, local artwork displayed on butternut squash-yellow walls and cozy tables available both inside and out. While we were there, a couple of the locals came through and asked about vegan and vegetarian options. Not only were they directed to the items on the menu that met the criteria, they were given the option of asking for a special order and were accommodated. I think that's special. We looked over the menus and placed our orders, and settled down to a nice bit of conversation . Hot cheese bread still contained in the flower pot it was cooked it was brought to our table with cool butter. The two of us sampled a couple of the different appetizers. The Squash Relleno was surprising -- baby squash split open and filled with cheese, then dipped in tempura batter and deep fried. The little squash were light and savory, and the sauce they were served with very spicy and sweet. 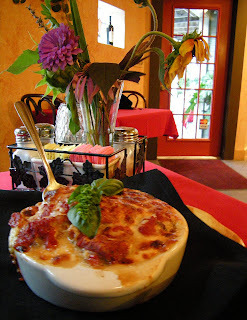 We also sampled the Asiago Cheese Stuffed Mushrooms in Marinara Sauce ($5.95), served up in an escargot tray. The individual savory bites were packed with cheese and went well with the cheese bread. And wow were they hot. The two of us split on our dinner options. 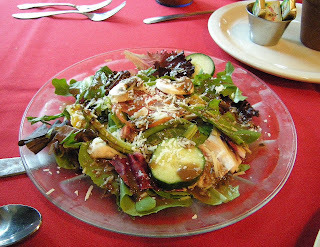 My companion went for the house salad with one of the four housemade dressings, a honey vinaigrette without a harsh vinegar bite. 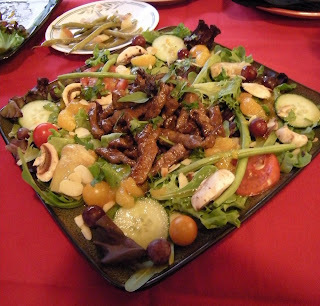 The blanched green beans and fresh sliced mushrooms were a welcome departure from the standard dinner salad. I got the soup, and I was glad. 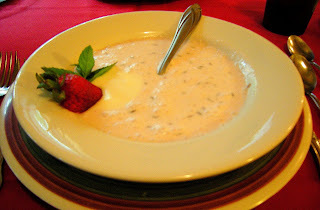 The Strawberry Lavender soup served up with a dollop of heavy cream was divine. The sweetness of the soup was muted, more a refreshing palate cleanser, with the staccato peppery pop of lavender seeds within. It was unabashedly lick-the-bowl-clean good. 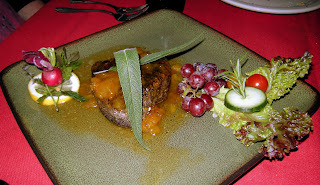 My companion chose the Peppercorn Encrusted Ahi Tuna with Peach Apricot Habanero Sauce ($19.95). The thick cut section of tuna was seared darkly but cooked medium rare like a good steak. The tuna was melty light and delicious, but there was an afterthought of strong apricot and peach that was just about covered up by the habanero at the end. Worthy, but certainly a dish for a spicy food lover. We adored the presentation, which included real flowers and grapes and greens cut into more flowers -- like a garland for the tuna. My Asian Beef Salad (“Sautéed in a Spicy Peach Soy Sauce Served On A Bed Of Fresh Greens With Veggies And A Mandarin Peach Dressing“) ($15.95) was a cacophony of flavors, savory and sweet beef amidst yellow and red plum tomatoes, sliced almonds, cucumbers, baby greens, grapes, mushrooms, Mandarin oranges and blanched green beans. So many little flavors. Vegetables are all-you-can-eat and served family style. We enjoyed green beans and potatoes that had been simmered together in a bacon broth, along with sweet steamed corn on the cob that tasted like it could have just been picked in the backyard and brought straight in. Dessert was an adventure. We ended up sampling all three offered that day. Hey, you only live once! 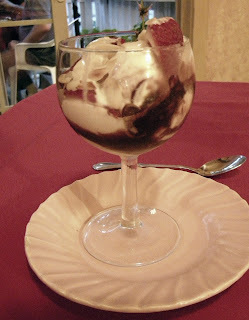 My companion tried the Sundae (Chocolate or Caramel $5.50), going for chocolate and happily accepting the offer of fresh sliced strawberries and almonds. The wineglass dessert was the perfect size for finishing the night. I tried the Blackberry Pie ($4.50) and couldn’t resist also ordering the unusual dessert, the Cornmeal Sugar Cookie with Lemon Curd and Whipped Cream ($4.50). 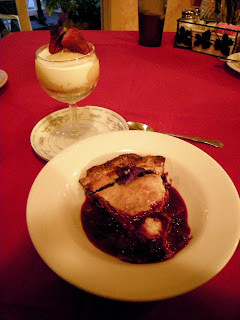 The blackberry pie was all the glory of tart and sweet in a hand thrown crust with none of the tick bites or briar bramble wounds. But it was the sugar cookie that did it for us… a nectarous cornmeal cookie balanced perfectly by the tartness of the lemon curd and the lightness of the cream. Unusual, but fantastic. I like the little restaurant, and I hope it survives. Lana’s trying to do what she did when she lived in Missouri -- create different fresh things every day based mostly on the items she can find at area markets and meets. That’s hard to do, and I have to give her a tip of the proverbial hat. I wish more restaurants did that. 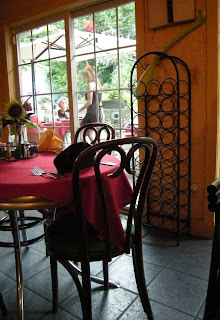 Oh, lunch is served there, too -- tea room style -- with quiches and soups and salads and pastas and sandwiches. And fresh hot baked bread, too. 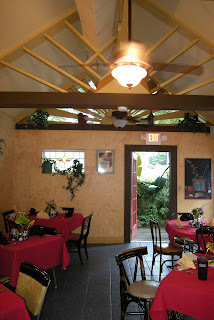 You’ll find the Garden Bistro at 119 North Main in Eureka Springs. Lunch and dinner are served Thursday through Monday. The restaurant is closed Tuesday and Wednesday. For more information, call (479) 253-1281. A Surprise Start at The Finish Line Cafe. Sam Choy's A Rather Nice Fellow. Another Fabulous Fair Food Preview.